Childhood development essentially makes up the cognitive evolution, social interconnectedness, and physiological makeup that takes place between birth and adolescence. Autonomy, or self-sufficiency, is the ultimate goal for children. While the rate and speed at which a child develops drastically varies, certain actions can be taken to strengthen necessary motor skills to ensure adequate self-dependency. Normalcies often become blurred and each child must be observed independently. Albert Einstein adopted this type of creative observation ideology and even more, alluded to the extraordinary capabilities of all minds. “Everybody is a genius. But if you judge a fish on its ability to climb a tree, it will live its whole life believing that it is stupid.” Education and mental stimulation are synonymous in case studies involving childhood development, however, taking into consideration the individual child on a case-to-case basis is vital. What role do educational programs play in childhood development? Overall genetic makeup, general diet, ethnicity, and physical exercise all play central roles in the growth (physical, emotional, mental and social) of a young child. Early childhood programs bridge the gap where a lack in psychological encouragement can have adverse disruptions on fully developing intellectual capacity at a prestigious level. 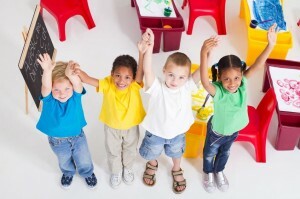 Preceding evidence suggests that actively introducing a child to non-curricular events where a positive stimulus is created has a direct and linear connection to substantial childhood development that critically affects his or her course well into adulthood. While activities outside of a classroom have typically presided over standardized education, school engagement in the developmental process of a child has become frequently visited as a viable source of measure and affect. Nurturing ethnically inclined differences by participating in bilingual literary programs allows a school to create a new baseline for childhood guidance as it relates to the maturation process. The mere concept of bilingual and multilingualism in the classroom has only recently been implemented as a benchmark for socialized development in children, but the benefits of introducing a child to cultural differences have seemingly outweighed any backlash or negative connotations. Notice the apparent focus on the early stages. The cycles are shorter and the evolution is abrupt. The cognizance of a small child is elevated and more susceptible to fundamental absorption during this time. The increased awareness revolving around the overall advancements of a child has birthed new theories, ideologies, and strategic implementations to be taken into consideration while observing early childhood development. In historical theory, a child progressed effortlessly through the aforementioned stages of mental, physical, and emotional childhood development. Those that were slower than the mass majority were written off and tagged as developmentally slow. We now know that a child’s environment, among countless other factors (including access to digitized equipment and technology in general), plays a critical role in maturation, humility, and confidence. Digital impacts were not an area pertinent to observation several years ago, nonetheless, the world is constantly evolving, so too must the understanding and reflection of childhood development.